Nothing is better in the summertime than fresh peaches, especially when they come from Karlynn’s recent road-trip to Victoria. Fresh BC peaches are hands down one of the best fruits you’ll ever eat and this drink shows them off in a great way. I call this the Sparkling Peach Sangria. There are two key components to this drink; Moscato (for the sweetness) and Peach Schnapps. In this particular recipe, we’re using Moscato from Barefoot Wine. 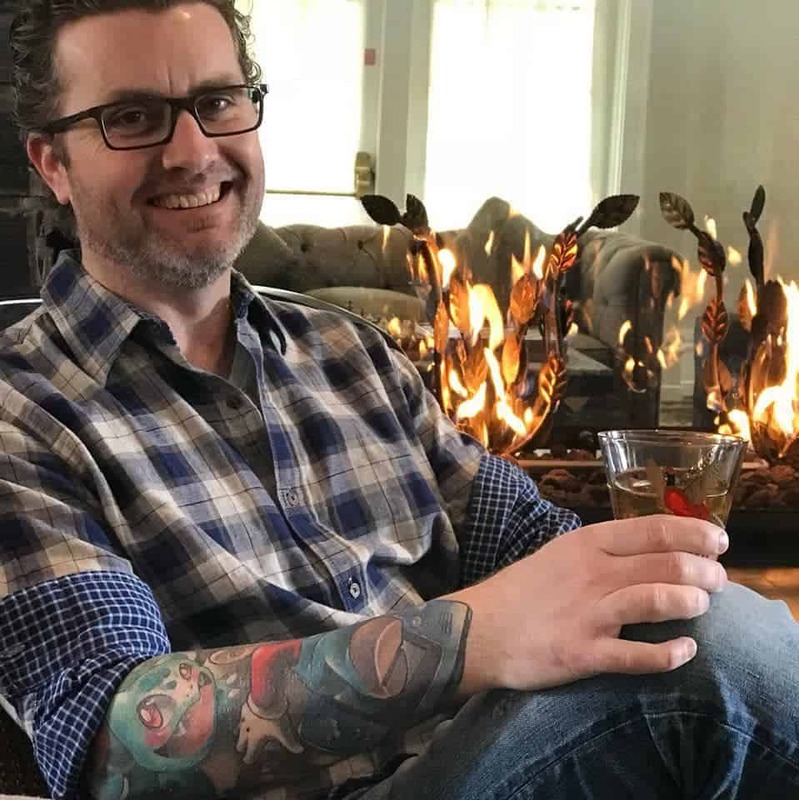 This recipe is not something you make a single glass of so break out the pitcher and a couple of tumblers before we get started. Add in a full bottle of Moscato, 2 cans of Club Soda, 1 cup of peach schnapps and 2-3 sliced peaches. Mix together with plenty of ice and you are ready to serve. 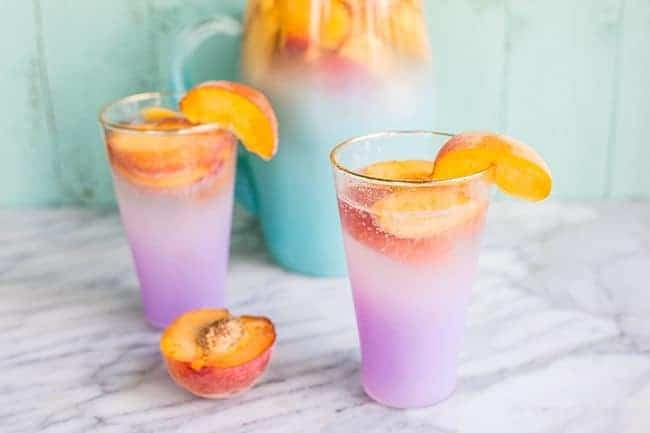 There are two things about this drink that make me happy.. First it’s a very easy drinking summer cocktail and second, you get to eat the boozy peaches when you’re finished. You may also want to make sure you have more than one bottle of Moscato kicking around because it’s very likely you’ll want to make a second pitcher. It’s that good. Be sure to add a slice of fresh peach to the side of the glass for garnishing. 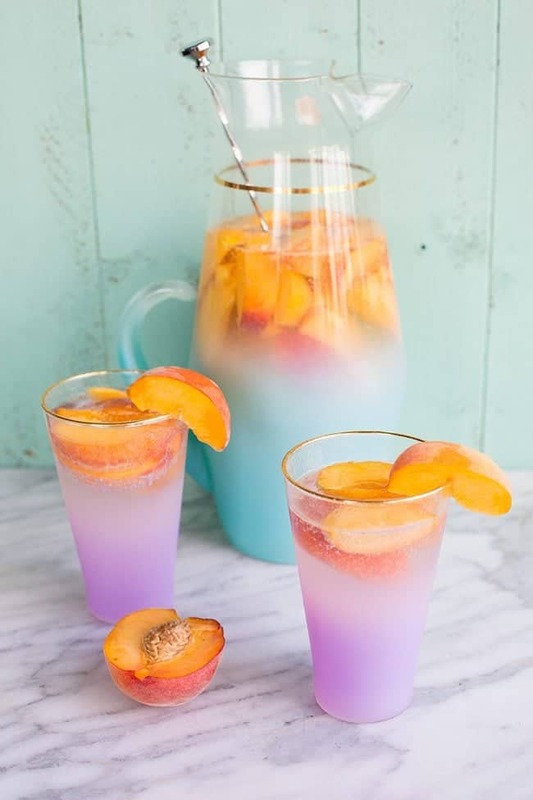 You can also muddle some of the peaches in the bottom of the pitcher if you want to get more natural flavours mixed in with the rest of the drink. Man, writing this just makes me want to go make another pitcher. I hope you like it, until next time, have a happy Thirsty Thursday. 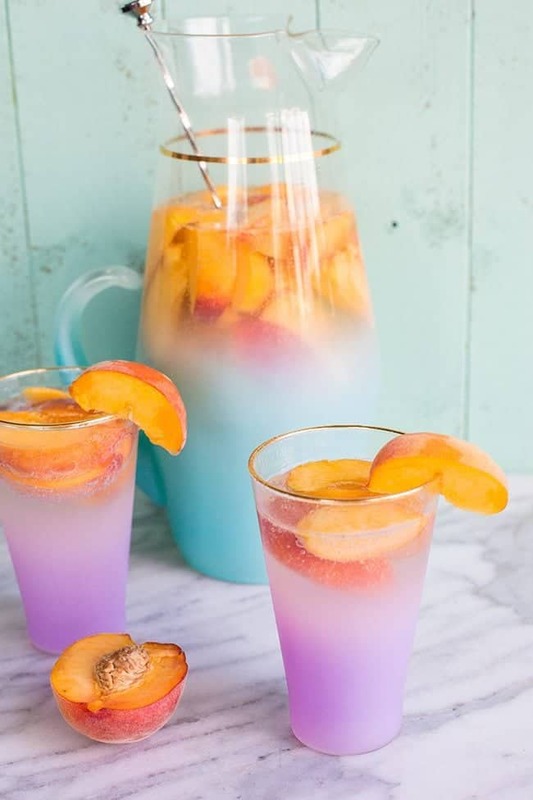 I'm warning you, once you try this Fizzy Peach Sangria, you will be ruined for ALL other sangria's ever again! 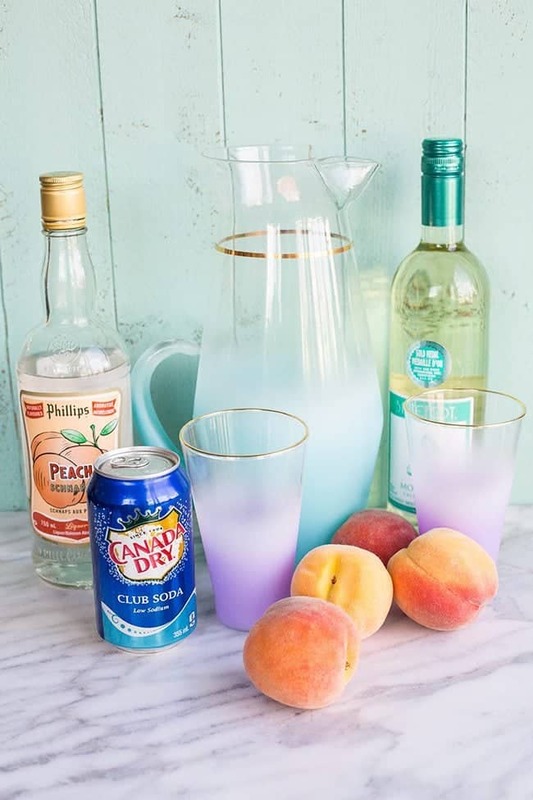 Sweet, peachy and bubbly, this is Karlynn's new favorite cocktail for the summer! Combine one bottle of Moscato with 1 cup of peach schnapps and two cans of club soda. Add in 2-3 sliced peaches, mix, garnish and serve. Jessica Martin- we need fun drinks for next weekend! I am in LOVE with that glassware!!! It’s my new favorite! It’s in antique malls every now and then if you keep an eye out! Looks so beautiful in that pitcher and glassware!! One Of my favorite finds my last US trip, that set was only $25! Awesome deal! If you ever make it to the Cleveland, Ohio area you should check out “Flower Child”. Such an amazing blast from the past shop. Its like a museum! 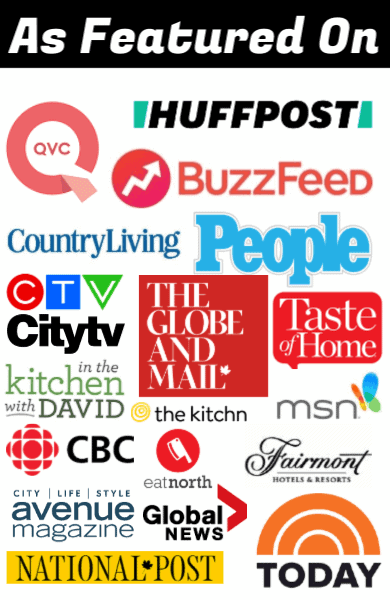 The Kitchen Magpie awesome I will have to try it for sure!